We are thrilled to publish the three winning short stories from the Worth Your Salt: A Fiction Contest, ending with this winning piece, “Confessions of a Sixth Grade Siren” by Dana Langer. To enter the contest, each writer chose one of three prompts, each an excerpt from Jeff Smieding’s serial ebook, And In Their Passing, A Darkness: The Salt Machine (Red Sofa Books), and used it in their story. “Confessions of a Sixth Grade Siren” uses the following Salt Machine excerpt: “She is tall and thin, with watery eyes and fishbelly white skin.” Extensive thanks to Red Sofa Books and our fantastic judges, David Oppegaard and Esther Porter. School starts at 7:30AM, and you have to show up on time and stay awake for algebra, even if you were up causing shipwrecks until 4AM the night before. No matter how hard you try to stay organized, you’ll end up using your school bag to collect trinkets from shipwrecks, and then you’ll never be able to find your homework. By the time you get home, do your homework, and cause a shipwreck, there’s no time at all for extracurricular activities. You can basically forget about gymnastics tryouts. This is how it happens: My sisters and I walk together through the storm, raincoats and boots thrown hastily over our pajamas. The rain soaks us, but we don’t care. It’s like we’re in a trance. We can see but not speak. We know where we are, but we can’t feel anything at all. Except there is one problem: I can’t sing. My sisters always tell me it’s because I’m the youngest. “You’ll learn,” they say. “You’ll get the hang of it.” But every time I open my mouth, it’s like the croaking of a frog. The song is there, in my head, but I can’t get it out. And so I just stand there in the rain and mouth the words. It’s 2AM, and we are perched on the cliffs overlooking the sea. Purple forks of lightening split the sky, and the rain pours down. The wind howls through the trees and tangles in our long, wavy hair. I used to be afraid of storms like this. I’m not anymore. Out on the water, a massive trawler has lifted its nets and is heading straight towards us. My sisters sing louder and the trawler picks up speed. Seconds later, it runs aground on the rocks hidden just below the dark water. We hear a tremendous crash, and wooden beams splinter and fly into the air. The masts crack and fall into the sea. It’s over. The ship is finished, wrecked on the jagged coast below. We’re all exhausted, and we fall asleep, right there in the grass, lying in a tangled heap of bodies and wet clothes. In the morning, the storm fades, rolling off over the deep part of the Ocean. The rain stops, and the sky turns pink. Far below us, the body of a ship lies on its side like a wounded whale. The Sea Witch has already left her shack on Witch Island and rowed across the inlet in her little hand-painted canoe. Now, she picks her way carefully among the rocks, leaning on her rickety walking stick, carrying a burlap sack full of empty glass jars. Her wild gray hair blows crazily in the breeze, and she seems about three hundred years old. Her back is stooped, and she is tall and thin, with watery eyes and fishbelly white skin. Clinging to her cane, her hands are as wrinkled and gnarled as the driftwood. And so we scavenge the wreck. Lara and Lily climb up into the ship, and Lula and I go to work prying the lids off of cargo crates that have landed face down in the sand. We work methodically, silent. As long as the spell holds, we remain disoriented and unaware of anything but the task in front of us. But my trance is starting to wear off. The sun is up, and the air is getting warmer, and I can feel beads of sweat start trickling down my back. I look back over my shoulder, and, when I’m sure the Sea Witch isn’t looking, I wander off a little ways down the beach. I’m starting to get bored. If I don’t bring any treasures back, I’ll get in trouble though, so I look around until I spot a few interesting looking buttons sitting amongst the rocks. I grab them and put them in my jar. And then I leave my jar in the sand, and I sneak around to the other side of the ship and start practicing cartwheels. I plant my palms in the firm, wet sand and flip over, keeping my legs stick straight, and I let the feeling of flying take over. Just for a second, arms and legs outstretched, I completely forget where I am. Who I am. It’s like I could come right side up and find that I’m just a normal girl again, and my mom is still here, and nothing is lost. Dana Langer holds a BA in creative writing from Brandeis University where she was the recipient of the Zamarripa-Gesundheit Memorial award for a senior thesis in fiction and published a short story in Laurel Moon. After graduation, she received a scholarship to study writing at the Summer Literary Seminars program in St. Petersburg, Russia. She currently lives in New York City and teaches English at a private high school. 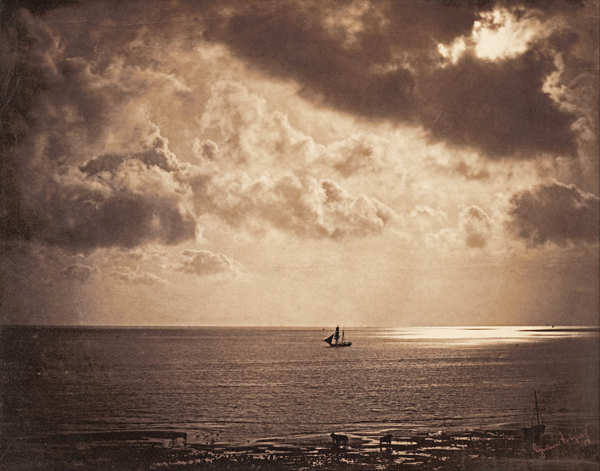 Artwork: Gustave Le Gray, Brig upon the water, 1856. Photograph. Nelson-Atkins Museum of Art, Kansas City, Missouri.